Fall. It’s more than desperately trying to dodge the hidden poops among the fallen leaves! It’s the kick-off to holiday season. So, with Thanksgiving just around the corner, here’s a RECIPE to get you through the day with your dog (in style!). Since this holiday is ALL about the FOOD, here’s how to use your dog’s OWN meals to help you enjoy the day without losing your mind. A SAFE ZONE: If your dog is overwhelmed by all the fuss create a safe place where your pup can get away. Or, if you have a cheeky little monkey who looks for trouble — don't be afraid to bust out the crate! Stuff your dog's dinner inside a puzzle toy. Kongs and Squirrel Dudes are perfect for this. Mix it with a bit of natural yogurt or peanut butter and put it in the fridge (or freezer for the expert chewers). If you just want to use dry kibble, no worries — pop it in a treat ball instead. Buy a BIG one from the butcher and put that in the freezer too! Give your dog a good run BEFORE it gets crazy in the afternoon. Don't be shy about enlisting help if you're cooking. Make sure your dog is REALLY tuckered out. Guests can be so exciting to dogs! Sometimes that means 'happy diving' on family members at the front door. So, remember that food container that the kids filled earlier? Here's where it comes into action. As the doorbell rings, skirt any embarrassing moments by simply taking a handful of that breakfast kibble - stick it in front of your dog's nose (so that they can smell it), then roll it AWAY from the door as you open it. Your pup will be so busy playing vacuum cleaner in the corner, they'll forget all about harassing the guests! Who doesn't want to be involved in good conversation — your dog included! If they're a little too involved, though, (or worse – sloping off to cause mischief) this is the time to pull out the puzzle toys and keep them busy with their OWN things. If you think Thanksgiving dinner smells good to you, just imagine trying to resist it when it smells THOUSANDS of times better! 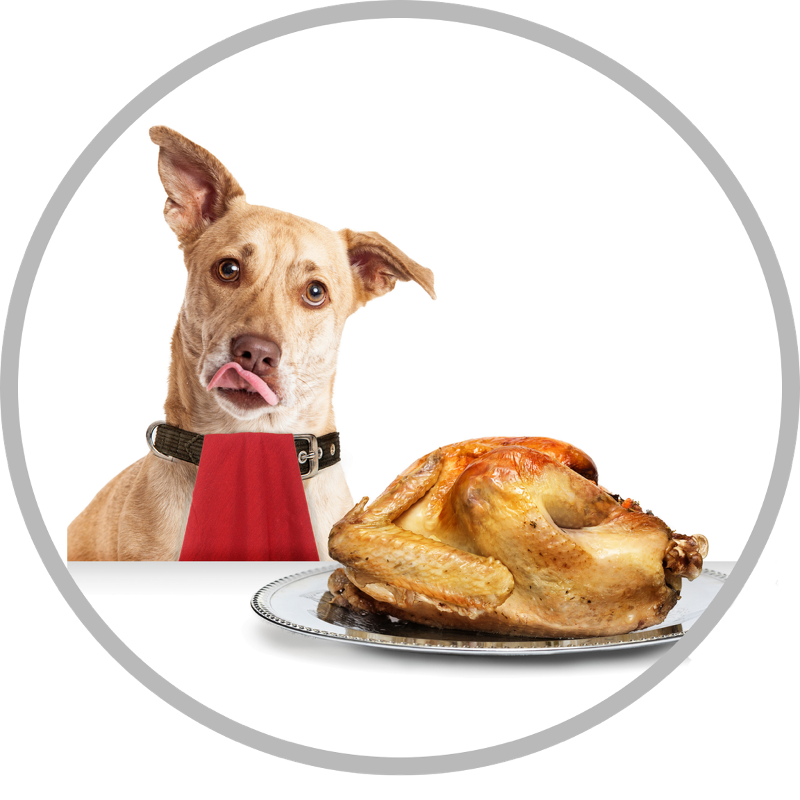 A dog's sense of smell will lead him straight to the goodies, so pull out that marrow bone and let your dog go to town on a delicious Thanksgiving treat of their very own. Be sure to use the SAFE ZONE if you think they'd be happier away from the action. You're stuffed and ready for a nap — so why isn't your dog snoozing too? If you've got a pup that's still good to go, now is the time to pair him up with that other energizer bunnies in your crowd. If it's your kids who are ready to run around — they can play games with your dog or even show off all his tricks to the crowd! The recipe for Thanksgiving bliss — even with a dog (OR 3!!) in the mix! Let's get stuffing those food toys! Need more tips on just generally surviving life with kids and a dog? Then check out PEACE LOVE KIDS & DOGS our online program (created especially for young families). Grab your 40% Black Fri-Yay discount by entering code: BLKFRIYAY. (Offer valid until 11/25/18).